5+ Cryptocurrency and Bitcoin Exchange Fees - Cryptolinks - The World's Best Cryptocurrency Sites List! Most times when we talk about the word “trading” it most likely involves money such as those called traders in the market, they trade their goods in exchange for money probably they bought something for 5 dollars and they sold it for more- that's a gain. Have you heard of any trader in any business that trades for free without collecting fees? All traders have these in common. Also Cryptocurrency traders or investors must always press harder and sell wisely in order make gains and not losses. Some Cryptocurrency traders are looking for safe means to calculate their transaction fees every now and then, maybe they have visited sites that make use of calculators or a different whole level to calculate the fees charged for every transaction with any digital currency and most of them have let you down by providing inaccurate or wrong readings; however if you fall into any this category, there is a solution to your problems. There is a platform that has provided everything you will need by collating and providing unlimited access to sites that can help solve your problems. On this site you can find over five (5) different sites in Blockchain fees category, which stand to provide with maximum amount of information on transaction fees and little world around. These sites include Bitcoin Fees, ETH Gas Station, transaction fee info, WhatTheFee.io and BTCFees. These sites have been properly tried out and tested dependable and reliable, well collated such that they can help provide Cryptocurrency traders with all the information needed in this Blockchain fees category. Many experts in the field have examined these sites and are still customers and viewers because of the amazing characteristics they have to offer. One of the ways to keep a cryptocurrency trader glued to your site is to provide him/her access to check important data on his/her past transaction. Most of these sites have made it their area of specialization as they know how highly important it is in the field of Cryptocurrency trading, investing as well as mining. Some of these sites help to keep you updated on information about your transaction fees. You can do that by either sending your previous transactions from service/exchange or from wallet service and then inputting your transaction ID in the space provided. You can also get access to information on your transactions on some of these sites in form of charts, tables or graphs showing the fees. Some of these sites help provide updated information and statistics on your transaction fees provides estimates, average distribution time and so on. Note that on these sites, transactions and services or wallets shown there are based on input of the user which means you're responsibility for the correctness of your data, it brings out information on what you put in. Some of these sites apart from providing useful information on/about your Blockchain fees, they also made readily available opportunity to learn a thing or about anything Cryptocurrency especially Bitcoin. On some of these sites you can learn how to earn with Bitcoin and lots other stuffs free, without paying any fees. 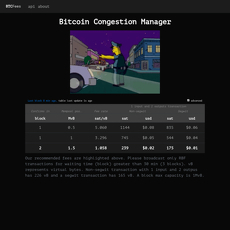 Some of these sites also help provide access to updated news in form of articles and links such as information on how to save up to 80% on Bitcoin transaction fees by batching payments by David A. Harding, how Zebpay reduced Bitcoin transaction fees by Zebpay (Bitcoin Exchange), An analysis of batching in Bitcoin by Nic Carter and @hasufly and so on. Some of these sites provide useful information on bothering issues and solutions to those issues such as Which fee should be used, What type of fees are shown there, What does the delay mean, how can one predict a delay and so on. Some of these sites provide extra benefits just for viewers to enjoy their experience on their sites. On some of these sites, you can get access to advertise your products and services by contacting them on their email address. On some of these sites, you can also get access to different tips on how to trade or earn digital money and so on. Some of these sites help provide you with links to important information so that you understand everything about Blockchain fees. In case you have any questions, some of these sites have made available a solution to your by click on a support link. In conclusion, it's important to know that these sites can give you opportunity to get access to anything about transaction fees and lots other things they have to offer.